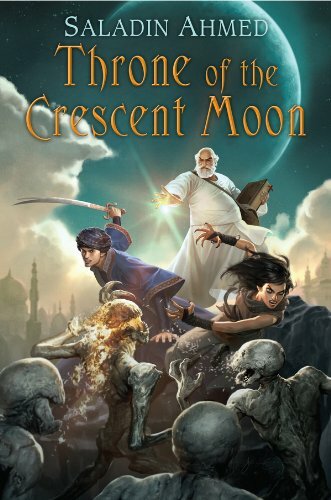 Saladin Ahmed’s Throne of the Crescent Moon is his debut novel and the first of the Crescent Moon Kingdoms trilogy. Its very title declares its departure from the usual Euro-centric fantasy. We read fantasy because we like unique worlds and engaging characters. Throne of the Crescent Moon definitely gives us the former, and it’s worth reading for that alone; though the latter felt slightly lacking. But for all its major issues, it is still worth the read. First, the good. Set largely in the sprawling Cairo-esque city of Dhamsawaat, Ahmed drops his readers right in the middle of the action. Very early on you get a good sense of Dhamsawaat, its atmosphere, its culture and its history. Ahmed also does an excellent job of filling in the world surrounding it. Presumably this sets the stage for the latter two books in the trilogy, and I can honestly say he does a great job of whetting our appetites. Ahmed’s superb world building goes beyond just his geography. This world is full of a rich, unique culture that seems to borrow from many aspects of Middle Eastern culture, but isn’t bound to any one in particular. From the cardamom teas the characters drink, to their formal and informal interactions with one another, the reader gets a good sense that these characters belong to a well-established society. Though it may feel foreign, it is definitely familiar enough to make sense. Now, the bad, or rather, the characters. They are frustratingly one-dimensional and any growth they go through is both glacial and shallow at best. These people are quite adept at slaying ghouls and other vile things, but they lack dimension or any desire to grow as human beings. Much of their character problems are self-imposed, and while that is a perfectly valid growth arc to have, they don’t progress along that arc very far. I’m verging into spoiler territory so I will try to tread carefully. That said, one particular character spends the entire book wallowing in self-imposed pity. He continually commits acts that go against his nature, then whines and mopes about having done so until he performs a different transgression a chapter or two later. This constant self-loathing and wallowing grew particularly annoying early on, and continued throughout the rest of the book. I should preface this by saying that despite my dislike of many characters, the book is still worth reading. As annoyingly one-dimension as some of the characters are, I still found myself particularly sympathetic to some in the party- though their arcs too are shallow and suffer from the same problems. That I had such a strong reaction to these characters is less of a problem with the book and more a testament to Ahmed’s ability to write. I recommend this book, if only for the world building and visceral prose Ahmed is so good at. but definitely you are going to a famous blogger if you are not already ;) Cheers! Continue with the reviewing! I’m confident they’ll benefit from the indepth book reviews.